I can’t help but feel sorry for the girl. $10 per call to send $ for charity!?! What a scam! TONY AIELLO: In this case, it’s text the word “Haiti” to the number 90999. So, “Haiti” is the body of the text message, and 90999 is the number you’re sending it to. The mobile user gets a response message, text message, asking them to reply yes to confirm their donation. Once they do, that triggers a billing event, and their mobile phone bill is tagged with a $10 donation. 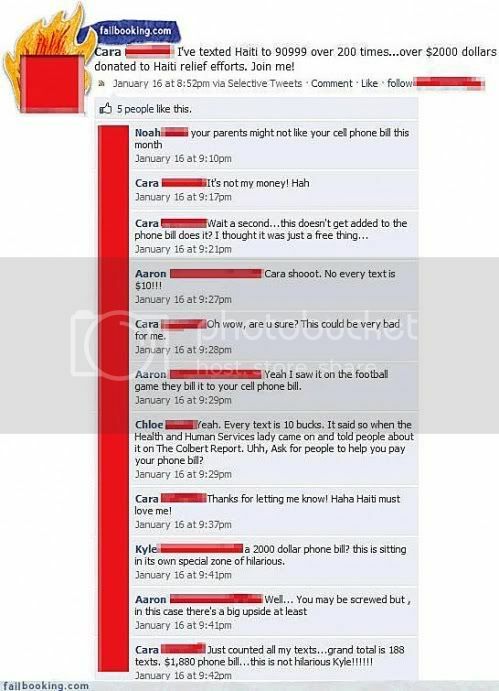 So, they actually pay that donation to their wireless carrier the next time they pay their bill. TOM BEARDEN: The cell phone companies then pay that money to mGive, which distributes it to the appropriate charity. Neither the carriers nor mGive receive any portion of the donation — mGive normally charges charities a monthly fee, but it’s waived that for the Haiti campaign. Other companies providing texting support for Haiti relief efforts include Mobile Commons, Wireless Factory, and the Mobile Giving Foundation, among others. Nonprofit organizations which use the technology say it makes giving extremely easy. TOM BEARDEN: Unfortunately, the whole payment process isn’t quite as quick as punching a few buttons on a cell phone. Charities don’t usually receive any money until people pay their cell phone bills. Sometimes, that can be as long as three months. …While the majority of organizations collecting money for Haiti are legitimate, the FBI has warned donors to watch out for bogus online and telemarketing campaigns. ← Would Someone Please Turn Off the World?? Becs, Huh ? for every 10 only 1 goes to haiti ? I’m sorry, but I am about to bust up laughing at that poor girl… “Wait a second… this doesn’t get added to the cell phone does it?” ROFL!!!!!!! That is so sad, but hysterical at the same time! I feel terrible for that girl at the same time I’m lauging-out-loud at that conversation. Oh my word, I wonder how this will turn out! Just so you know, RE– I did some research and it’s not $10 for every $1. I updated the information to reflect that. It’s $10 for every text, and it’s charged to your phone bill. Looks like some companies are waiving any fee for the charity, which is great. I passed over the text thing and went to charitynavigator.org instead. I picked one of the organizations where the majority of their funds went to actually DOING something in Haiti and put my donation there. Thanks for that info, Janiss!